High-quality Stainless Steel Multifunction Flashlight Pliers functions as a Flashlight, a cable scissors, a needle-nose pliers, a vise, a knife, a phillips screwdriver, a straight screwdriver, a fish scales, a bottle opener. Add this duo to your STMAN Outdoor Emergency survival gear kit, camp kit or survival gear bag get an extra set for car emergency tool and your family’s earthquake and disaster preparedness kit. Wilderness survival gear is a great gift for scouts and outdoor enthusiasts. 【Multi-Purpose Updated Tools】3 in 1 multi professional emergency survival kits. Containing: a Flashlight, a cable scissors, a needle-nose pliers, a vise, a knife, a phillips screwdriver, a straight screwdriver, a fish scales, a bottle opener. 【Cold Steel Military Knife】Heavy duty spring assist folding knife, easy and safe to carry,bottle opener for emergencies. 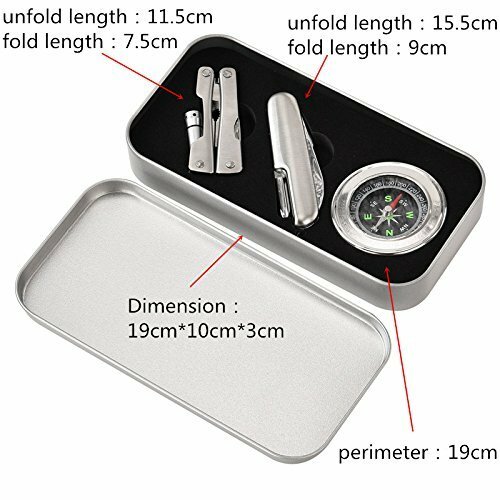 【Survival Compass】 This compass features 360 degree rotating bezel for easy navigation & orienteering. Waterproof and shake-proof ,convenient for see. Note: Before you use, please put it under the sun or under the light. 【Perfect Gift】It's necessary when camping, hiking, adventures, survival and in emergency situations. Your husband or brother would find this pretty cool as a stocking stuffer or birthday gift. And also can develop the child's ability to survive with kids hiking and camping kit. Giving a surprise to your Darling. 【LED Flashlight】The LED Flashlight equip with battery, shiiped by FBA, fast delivery.